A regular breeding resident and migrant. The Northern Rough-winged Swallow was uncommon during the Minnesota Breeding Bird Atlas (MNBBA). Widely distributed from central British Columbia, east across the southern edge of the Canadian provinces and south throughout all of the United States. Sparsely distributed throughout its breeding range; a few small centers of abundance can be found in eastern Mississippi, southern Arizona, and in western Nevada (Figure 1). Assigned a Continental Concern Score of 10/20 by Partners in Flight; designated a Species in Greatest Conservation Concern by the Minnesota Department of Natural Resources. Medium-distance migrant that spends winters in southern California, along the Gulf coast of the United States, and in Central America. Usually nests in burrows constructed by other species, including Belted Kingfishers, Bank Swallows, and small mammals. There are conflicting reports on whether the species excavates its own burrow. Breeding pairs may nest singly or in small groups consisting of a few pairs. Breeding distribution and relative abundance of the Northern Rough-winged Swallow in North America based on the federal Breeding Bird Survey from 2011 to 2015 (Sauer et al. 2017). Described as a breeding resident throughout the state, Roberts’s (1932) only caveat was that he doubted whether the species occurred in the state’s Northwest Angle, remarking that the “conditions” there were not suited to the swallow’s needs. Presumably he was considering the absence of much elevation in the Angle’s broad, flat landscape dominated by aspen-birch forests and coniferous peatlands. There were, however, reliable reports from many northern regions, including the Red River valley, from Clay County north to Marshall County, as well as from the northwest corner of Kittson County, Itasca State Park, Cass County, and Itasca County. Breeding evidence (both confirmed and inferred nesting evidence) was available from 9 counties in southern and central Minnesota (Fillmore, Hennepin, Houston, McLeod, Pipestone, Rock, Sherburne, Wasbasha, and Washington) as well as from Leech Lake and Itasca State Park. Roberts’s brief account notes that although the species was common, it was less abundant than the Bank Swallow. Forty years later, Green and Janssen’s (1975) updated account of the species’ distribution noted it was numerous in southern and central Minnesota and less numerous farther north, becoming scarce in the northeast. Several years later Janssen (1987) included a statewide distribution map that identified 20 counties, widely dispersed throughout the state, where nesting had been confirmed since 1970. Hertzel and Janssen (1998) later added an additional 6 counties to the list, all located from Aitkin County south. The Minnesota Biological Survey has documented 197 breeding season locations of the Northern Rough-winged Swallow during its field surveys. More than half of the records were located from the Minnesota River valley south to the Iowa border (Minnesota Department of Natural Resources 2016). During the MNBBA, observers reported 615 Northern Rough-winged Swallow records in 9.8% (465/4,743) of the surveyed atlas blocks and in 13.1% (306/2,337) of the priority blocks. Breeding was confirmed in 110 blocks (Figures 2 and 3; Table 1). Although the number of records was relatively small, the birds were observed in 83 of Minnesota’s 87 counties and were confirmed breeding in 59 counties. Thirty-six of the counties were new to the list published by Hertzel and Janssen (1998); 7 of the new counties were included because of blocks that crossed county lines (Big Stone, Cass, Itasca, Lac qui Parle, Renville, Yellow Medicine, and Washington). Found throughout the state, the majority of records were in southern Minnesota, from Big Stone County east through St. Cloud and Chisago County and further south. The Northern Rough-winged Swallow had the fewest total number of MNBBA records of the six members of the swallow family that breed in Minnesota. The distribution and relative abundance of the Northern Rough-winged Swallow has changed little in Minnesota over the past 100 years. The state is near the northern periphery of the species’ breeding range, and the swallow is increasingly sparse as one moves north of the Brainerd Lakes region and Duluth. Elsewhere within its breeding range, records suggest the swallow may be expanding north in the Midwest and New England, and south along the Florida peninsula. Whether this represents a natural range expansion or is simply the result of better documentation of the species’ distribution by field observers is unknown (De Jong 1996). Anyone who has struggled to correctly identify swallows as they swiftly dart about on the wing appreciates the challenges of field identification. Even John James Audubon, in his first encounter with the bird, summarily dismissed them as Sand Swallows, now known as Bank Swallows, until tired by a long day, he sat down and shot a few and could clearly see their distinguishing features (Bent 1942). Breeding distribution of the Northern Rough-winged Swallow in Minnesota based on the Breeding Bird Atlas (2009 – 2013). Summary statistics of observations by breeding status category for the Northern Rough-winged Swallow in Minnesota based on all blocks (each 5 km x 5 km) surveyed during the Breeding Bird Atlas (2009-2013). Summary statistics for the Northern Rough-winged Swallow observations by breeding status category for all blocks and priority blocks (each 5 km x 5 km) surveyed during the Minnesota Breeding Bird Atlas (2009-2013). The Northern Rough-winged Swallow is considered a species of the open country. Even a long-term study of forest birds on the Chippewa and Superior National Forests in northern Minnesota, from 1995 to 2015, failed to document the species’ presence in these extensively forested landscapes (Bednar et al. 2016). Although the swallow is closely associated with water, its selection of habitat is likely influenced more by the availability of suitable nest sites. A burrow nester, the swallow prefers vertical banks of sand, gravel, or clay. Whether Northern Rough-winged Swallows excavate their own nesting burrows or simply rely on old burrows abandoned by other excavators, such as kingfishers and Bank Swallows, is still disputed (De Jong 1996). Regardless, the suitable substrates for primary excavators are often adjacent to water bodies and found along rocky gorges, lake shorelines, and the banks of rivers and streams (Figure 4). In agricultural regions they have been reported nesting in the steep banks of irrigation ditches (Dawson 1923). An adaptable species, the Northern Rough-winged Swallow may nest in anything resembling a crevice along a vertical surface, including cracks in building walls, drain pipes in retaining walls, quarry embankments, and bridge ledges (Bent 1942; Roberts 1932). In Canada it is estimated that 30% to 60% of all nesting occurs in human-modified habitats, including road cuts, gravel pits, and building walls (Erskine 1979; Campbell et al. 1997). Foraging usually occurs over water, open fields, and low brush (De Jong 1996). The predominant habitat within 200 m of MNBBA point counts where Northern Rough-winged Swallows were detected was oak forest (Figure 5). This likely reflects the deciduous floodplains within which most swallows were encountered. Because lowland hardwood stands were so infrequently encountered near the MNBBA point counts they were not distinguished as a separate habitat category. Typical Breeding Habitat of the Northern Rough-winged Swallow in Minnesota (© Lee A. Pfannmuller). Habitat profile for the Northern Rough-winged Swallow based on habitats within 200 m of point counts where the species was present during the Minnesota Breeding Bird Atlas (2009-2013). Field data collected by the federal Breeding Bird Survey (BBS) have been used to generate a North American population estimate of 16 million breeding adults (Rosenberg et al. 2016). In 2013, Minnesota was estimated to support 2.1% of the continental population (Partners in Flight Science Committee 2013). When that percentage is applied to the most recent population estimate, it yields a statewide estimate of 343,000 adults. A map of the species’ relative abundance during the breeding season derived from federal BBS data clearly illustrates that the species is relatively uncommon in the state compared to other portions of its breeding range (Figure 1). It is encountered so infrequently in the northern regions that it is rarely encountered during the annual BBS surveys, including across northern Minnesota. Overall, the swallow’s patchy distribution has made it difficult to estimate breeding densities (De Jong 1996). However, BBS data may provide the best indication of relative breeding abundance. In Minnesota, the average number of swallows observed on a BBS route each year is 1 to 2 birds. The species reaches its greatest relative abundance in the Appalachian Mountains region of the eastern United States, and in the Sonoran and Mojave Deserts region of the Southwest, where 3 to 4 birds are observed on each route (Sauer et al. 2017). Since the BBS began in the mid-1960s, the Northern Rough-winged Swallow population in North America has declined an average of 0.53% per year. Numbers have stabilized in recent years, however, demonstrating a small increase of 0.73% per year since 2005 (Sauer et al. 2017). Minnesota has witnessed a far steeper and significant decline, averaging 2.44% per year since 1967, with little notable change until recently, when populations show some indication of a more stable to increasing trend (Figure 6). Despite these declines, there are regions where the species is faring quite well, including the Lower Mississippi River valley, the Eastern Tallgrass Prairie, the Central Hardwoods, and several regions in the western United States (Figure 7). Range-wide, the species’ population is estimated to have declined 18% since 1970 (Rosenberg et al. 2016). Factors responsible for these long-term declines are not well known. The availability of suitable nest sites is considered a primary concern, yet the species has done well in adapting to nesting opportunities in the developed landscape. However, as an aerial insectivore, the species is within an entire guild of aerial foragers whose populations have declined in recent years. For many of these species, the declines became most notable in the 1980s and were particularly acute in the northeastern United States. This led some to speculate that industrialization may be negatively impacting insect populations (Nebel et al. 2010; Smith et al. 2015). Indeed, one region where the Northern Rough-winged Swallow has declined significantly is the lower Great Lakes–St. Lawrence region, which includes such large metropolitan areas as Detroit, Cleveland, and Toronto. Yet, a steeper decline has been documented in the Boreal Hardwood Transition region, which spans the northern Great Lakes and includes the extensively forested landscapes of northern Minnesota, northern Wisconsin, and northern Michigan (Sauer et al. 2017). Because the swallow is an open-country species, often restricted to the riparian shorelines of rivers and lakes in densely forested landscapes, the increase in recreational homes along these shorelines may be contributing to the decrease in northern populations. 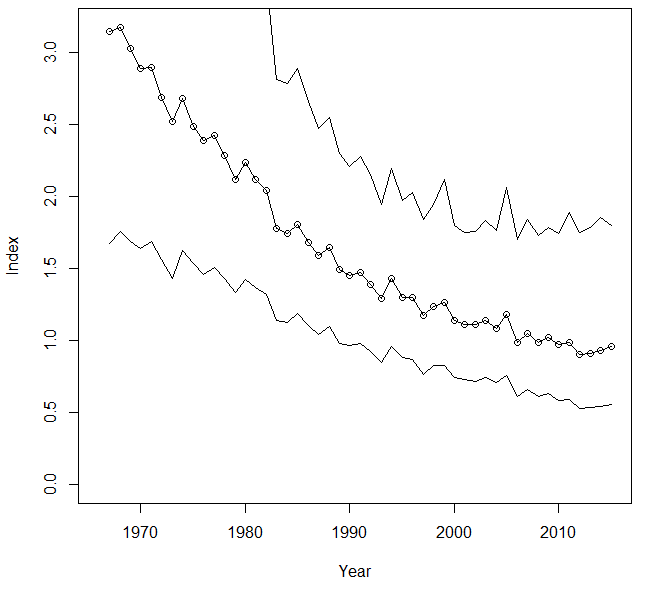 Breeding population trend for the Northern Rough-winged Swallow in Minnesota from 1967-2015 based on the federal Breeding Bird Survey (Sauer et al. 2017). Population trend map for the Northern Rough-winged Swallow in North America from 1966-2015 based on the federal Breeding Bird Survey (Sauer et al. 2017). In light of its declining population trend, the widely distributed Northern Rough-winged Swallow has been assigned a moderate Continental Concern Score of 10/20 (Rosenberg et al. 2016). It is not considered a conservation priority at the national level. However, its rather steep decline in Minnesota has prompted its designation as a Species in Greatest Conservation Need (Minnesota Department of Natural Resources 2015). Specific management recommendations and conservation actions are limited. Artificial nest burrows have been utilized successfully in some situations, resulting in occupancy and nest success as high as 80% to 90% (De Jong 1996; Lunk 1962). Although the impacts of warming temperatures on Northern Rough-winged Swallow populations have not been closely examined, the 2010 “State of the Birds” report assessed its overall vulnerability to climate change as “medium” (North American Bird Conservation Initiative 2010). This rather plainly attired and relatively silent swallow deserves careful monitoring in the years ahead. Campbell, R. Wayne, Neil K. Dawe, Ian McTaggart-Cowan, John M. Cooper, Gary W. Kaiser, Michael C. E. McNall, and G. E. John Smith. 1997. The Birds of British Columbia. Vol. 3, Passerines: Flycatchers Through Vireos. Victoria: University of British Columbia Press. Dawson, William Leon. 1923. The Birds of California: A Complete, Scientific and Popular Account of the 580 Species and Subspecies of Birds Found in the State. Vols. 1 and 2. San Francisco: South Moulton Company. Erskine, Anthony J. 1979. “Man's Influence on Potential Nesting Sites and Populations of Swallows in Canada.” Canadian Field-Naturalist 93: 371–377. Lunk, William Allan. 1962. “The Rough-winged Swallow, Stelgidopteryx ruficollis (Vieillot): A Study Based on its Breeding Biology in Michigan.” Bulletin of the Nuttall Ornithological Club 4: 1–155.